The module is constructed with three layers using double sided 1.6mm and single sided 0.8mm PCB. The inner layer being an almost continuous groundplane and also the negative (0v) rail. The wires will eventually be used to connect to the motherboard. A 3.6V DC supply is required. This version is a little cramped around the RF transformer on the right hand side of side 2 so a new layout will be drawn when all measurements on this first prototype are completed and any other errors resolved. I will also be packaging an alternative three transformer version using the FST3157 and 74AC04 based squarer in the near future. IK4AUY has also done significant work on the H-Mode mixer - see here. This is my first attempt at packaging a version of the H-Mode mixer by I7SWX. I have taken the revised circuit which has one less RF transformer and constructed it in a self contained module that may be built and tested and then mounted onto a printed circuit. The photographs shows its construction. Local oscillator input on the left, RF signal input on the right. The IC is a low voltage line receiver used as a squarer to drive the mixer. The IF output is on the right. The IC is the FST3125 bus switch mixer. Version 2 is based on the FSA3157 high performance front end by Martein PA3AKE using the H-Mode mixer which may be found here. My version is intended to be just a mixer module mounted onto the motherboard along with the bandpass filters, diplexer, roofing filters and post filter low noise amplifier. The module is built on a double sided PC board and the photo on the right is of the ground plane side. Mostly through hole leaded passive components are used although the active devices are all surface mount types on the other side of the PC board. 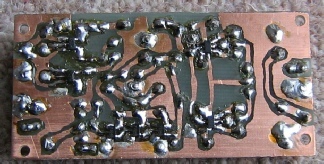 The board has been dipped in a tin plating solution. Local oscillator input is on the right hand side and the RF input and IF output are on the left. The view on the right is of the solder side with the five active devices. Soldering the SOT23 devices in by hand was an interesting task! The fine tracks on this side are non-ground connections with the remaining space filled in with ground copper. Top and bottom sides are linked using miniature eyelets. There are two low noise regulator ICs, one to provide 5V for the 74AC04 squarer and 6.8V to the FSA3157 mixer devices. An additional layout exercise has been completed to correct some minor layout rule infringements and to standardise on the use of 250mW through hole leaded resistors instead of 125mW types. The final size of the PC board is now 1.3 inches x 3.0 inches. The only surface mount items are now the five ICs of which two are mounted on SM to DIL adaptors. Full use of SM parts would doubtless decrease the size of the module although it would increase the constructional difficulties. This is a simplfied version of the original design with preset potentiometers to set the squarer and mixer bias levels for optimum performance. The revised layouts are shown below. There are a few unused holes which were drilled to provide guides for painting the tracks to the SOT23 adaptors. The mixer analog switches were SN74LVC1G3157 from Texas Instruments in SOT-23 packages which made the tracks easier to paint. However, these devices have a lower maximum supply voltage of 6.5V which must be allowed for when setting the output of the respective voltage regulator via R3. 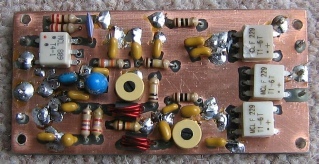 This version uses the T1-6T transformers. The tin plating was not so successful with this module. This version of the squarer does not self destruct if the local oscillator source is removed but it may oscillate with low / threshold drive levels. The recommended minimum drive level is 0dBm. Version 4 of the H-Mode mixer is now built using the above circuit on a smaller PCB sized 1.3 inches x 2.7 inches and the SOT23 devices are placed directly on the board with no adaptors. The revised hand drawn PCB layout may be downloaded from here. More care is needed in painting the small tracks around the surface mount devices. The symbol explanation document is here. Version 5 (hopefully the final version!) follows the above circuit but the layout has been amended to correct some minor errors in component spacings and the 74AC04 squarer has been changed to three separate ultra high speed 5volt inverters type NC7SZ04 to improve the very high frequency response and reduce the current consumption above 50MHz. The version 5 PCB layout document is available here - the PCB is the same size as version 4. This is my preferred version. Warning: The ICs used in the latest H-Mode mixer are much more fragile and susceptible to damage from excess voltages, electrostatic charges etc. It is recommended that each module be completely isolated from all equipment before any work including soldering is carried out. I have inadvertently damaged several ICs by not following these rules. This page shows my five packaged versions of the H-Mode mixer originally developed by Colin Horabin G3SBI and subsequently revised by Giancarlo Moda I7SWX and Martein PA3AKE - see the PA3AKE site here.